Six artists respond to snow. 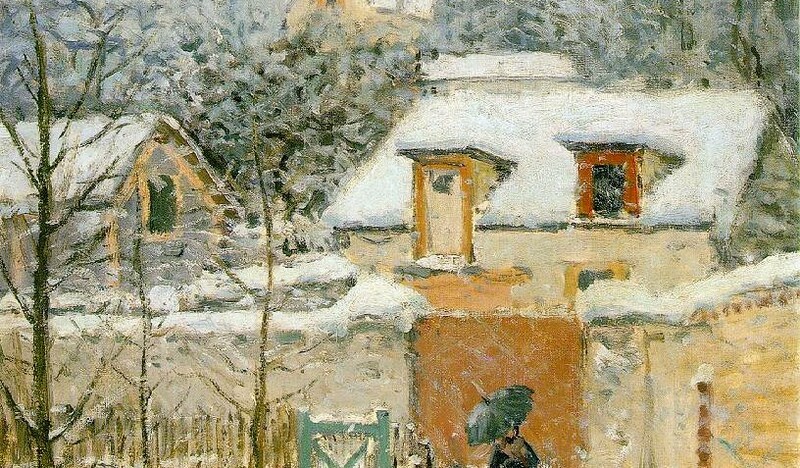 Three use snow as a constant reference in their paintings: Claude Monet, Camille Pissarro, and Alfred Sisley. Three paint with occasional deference to the surprise of winter color: Pierre-Auguste Renoir, Gustave Caillebotte and Paul Gaugin. The variations of the colors of snow and the seeming similarities of palettes bring out particular points of view often overlooked in other work of these painters. Our attention is brought to details, encouraged to focus on effects which might be missed elsewhere. Claude Monet, the most prolific of the six, becomes more daring in his later paintings, juxtaposing a red scarf or shocking train lights against the vagaries of soft snow&#146;s prismatic shimmer. Pissarro shows sinuous soft focus. Renoir&#146;s work, usually translucent, shows hard edges and unexpected compositions. Gaugin carries a practically tropical green to the Seine and sensuous curves to Breton village cottages. Get lost in great golds of Sisley&#146;s evenings and stare at the brilliant peach colored balloons in a snowy crowded street. Don&#146;t miss Caillebotte&#146;s magnificent sculptural elements that anchor his paintings. This exhibit reveals the underpinnings of beautiful paintings. The contrast of the snow against other elements in the paintings brings the angle and lines of the landscape to dominance. The curves of the hills, emphasized perspective lines of Pissarro, the angles of the roofs make us see the fine attachments of the abstract to the beautiful representation of the scenes. The colors of snow–this show will warm you.